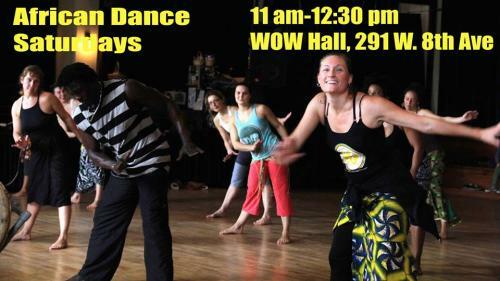 Join Alseny Yansane of West African Cultural Arts Institute for a fabulously fun African Dance class that welcomes all dancers. This Saturday class from 11:00 am to 12:30 pm is an excellent way to kick off your weekend with an encouraging community vibe and heart pounding and sweat producing dance moves all to the powerful beat of live drumming! This class is conveniently located in downtown Eugene, Oregon in the beautiful Community Center for the Performing Arts (WOW Hall) on the corner of 8th and Lincoln Street. Students will enjoy the spacious dance floor of this historic building which has 1600 square feet of dance space and floating wooden floors. This one and a half hour dance class is a perfect blend of exercise, culture, community, and self-expression! WOW Hall, 291 W 8th Ave.
Live drumming; tips for the drummers is highly recommended!